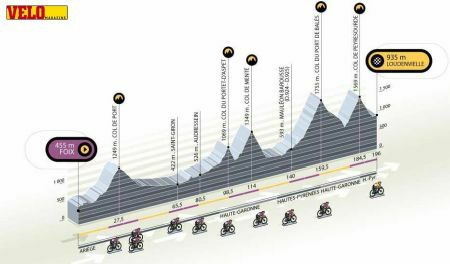 This French Life had a great post called "The hell of l’Étape du Tour"
IF you have watched a stage of the Tour de France in the past few days and thought "I could do that", well you can but be warned. Each year one of the stages is opened up to cyclists for l’Étape du Tour giving mere mortals the chance to experience the climbs and descents of one of the mountain legs. Earlier this week around 8,000 people faced up to the challenge of tackling five mountains on the route from Foix to Loundenville in the Pyrenees, a distance of 196km that took some around 12 hours to complete and which will be attacked by the pros this Monday. The stage is set up exactly as the Tour cyclists experience with the gendarmerie out in force to guide people through, food stops and medical help for those struggling, fans lining the route and even a bus to collect the stragglers who are not going to make it. I passed lots of riders who had cracked - more vomiting, lying by the roadside than on the previous climb even, the ambulances seemed to be doing more work too. I established a rhythm of riding seated in my easiest gear for a few kilometres, standing up in the pedals for a few kilometres, and then walking a hundred yards. Everyone was doing it. We were no longer cyclists, but refugees. About 100 metres from the top "The game is won, victory is yours. It is well deserved." rang out from one group of locals bringing a tear of joy to my eye. So if you still fancy your chances of having a crack at one of next year's stages I'd get on the bike now and start racking up some miles.